We all know the benefits of exercise — it boosts your mood, strengthens bones and muscles, increases energy and leads to better sleep quality — but motivating yourself to get out of bed and away from your computer can be tough. 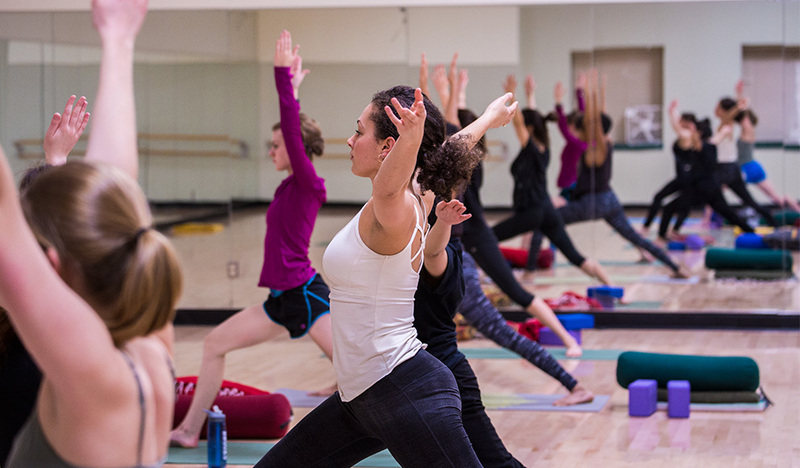 Group exercise, like the spinning, yoga and fitness classes offered by Wellesley’s Physical Education, Recreation and Athletics Department (PERA), often provides external accountability to get you up and active. According to National Public Radio (NPR), group exercise may provide even more advantages than traditional gym sessions by serving as a social outlet and a source of support, leading to improved mental health. Still not motivated enough? PERA’s fitness challenges, offered year-round, have an added bonus — winning prizes just for working out! Becky Kimball, Wellesley’s director of sports performance and fitness, created the challenges with the help of PERA’s student instructors. “They kind of evolve over time,” she says. “New [student fitness instructor] coordinators bring new ideas.” In the fall, PERA offers Coast to Coast Spinning, where participants try to log 215 miles on spin bikes over eight weeks, and the November Incentive, which rewards participants for taking six or more workout classes throughout the month. In the spring, students are challenged to complete Spring Into Shape — logging 150 minutes or 5 days of exercise a week for all of March and April — and Iron Human, a month-long biking, swimming and running initiative. The variety of programs “[gets] people involved in different areas of PERA,” says Kimball. “Really, it’s just about building our base — providing more than just group exercise classes, but providing an incentive behind those classes, and finding creative ways to get people interested in doing what we love to do [in PERA].” The challenges have been successful in increasing participation in recreation at Wellesley. Kimball notes that class attendance, especially for spinning and strength, has been on the rise. Additionally, over 2,000 people have used the Keohane Sports Center (KSC) this semester. To register, students have to fill out a Google form emailed by Student Fitness Instructor Coordinator Sophia Rim ’21. “Usually for each challenge, we have about 80-100 students registered,” says Rim, “but there are definitely students who are still participating in the challenges that did not formally sign up through the Google document.” The wide participation creates a sense of community for both participants and instructors by broadening social circles and pushing students outside their fitness comfort zones. After registering, students select which classes they take. PERA currently offers 16 student-led fitness classes, including High-Intensity Interval Training (HIIT), spinning, strength and yoga. According to Kimball, the types of classes offered depend on the student instructors available for a given semester — in the spring, look out for the addition of an aquatics class! Classes are held daily in the KSC, with the full schedule available on PERA’s website. Fitness challenges are a great way for students to stretch their limits with exercise, since they incentivize trying new classes. Rim, who participated in Coast to Coast and the November Incentive as a first-year, says, “It was a great way for me to meet the different instructors on campus, try out different styles of spin and take classes I did not see myself taking like Strength or PiYo.” Participants can keep track of their classes by logging spin miles or having their instructors initial a worksheet. Students who reach benchmarks or fully complete challenges can receive prizes from PERA, including T-shirts, stickers, headbands and water bottles. “They give students something to work toward and motivate students to progress their fitness journey,” Rim says. The prizes provide extrinsic motivation, which sports psychologists have shown increases participation and keeps students involved. Rim and her fellow instructors hope that the fitness initiatives will allow other students to discover passions for exercise, too. Regardless of whether you spin all the way to Los Angeles — 215 miles — or simply try out one HIIT class for the first time, PERA challenges are a fun, social and rewarding way to be fit and healthy!